Our eventful journey since 1973 is adorned with numerous milestones, achievements and awards,which we cherish. These awards are a reflection of the high brand equity we command in the market as well as the admiration and respect we have earned over the years. 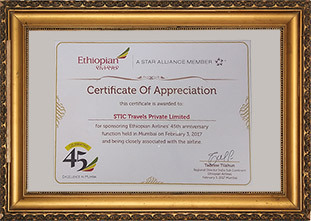 STIC has won numerous awards from government institutions, industry associations and also from the airlines it represents. "Most Influential Person Award" by Mr. Sanjiv Agarwal, Publisher & Editor, Travel News Digest and Chairman & CEO, Fairfest Media Ltd. to Mr. Subhash Goyal"
The Travel Agent's Association of India (TAAI) presented our Chairman - Mr. Subhash Goyal - with this "Appreciation Award" for outstanding contribution to the travel & tourism industry. 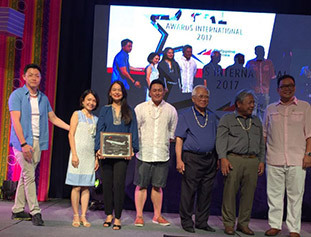 STIC Travel Group has received the Best Travel Company award during the concluded Commonwealth International Travel Mart (CITM) 2010, in New Delhi. 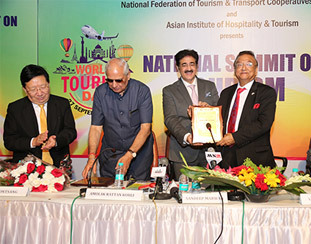 The award was received by Subhash Goyal, Chairman, STIC Travel Group. Goyal received the award from well-known Indian cricketer and Member of Parliament (MP), Navjot Singh Sidhu, in a gala award function at The Ashok International Convention Centre. Mr. Subhash Goyal, Chairman of STIC Travel Group receiving the Today's Traveller Award (2007) from Smt Ambika Soni. 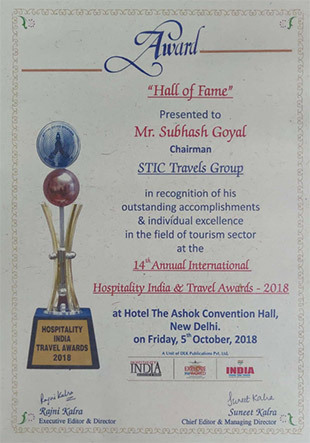 3rd Annual Hospitality India International Awards 2007 Presented by Praful Patel to Mr. Subhash Goyal, Chairman of STIC Travel Group. "Ambassador of India Tourism Award"
Mr. Subhash Goyal, Chairman receiving the award from the Minister of Tourism Ms. Ambika Soni at the recently held South Asia Travel & Tourism Exchange (SATTE). Ukraine International Airlines Prospecting and Promising GSA, 2005. Srilankan Cargo Outstanding Achievement New Delhi / Chennai, 2004-2005. ANA-Cargo Certificate of Achievement(BOM), 2004. Continental Airlines Outstanding GSA Performance, Oct. 2003. "Srilankan Cargo Outstanding Achievement, 2002-2003. "World's Most Outstanding GSA Award - Continental Airlines"
Awarded Top Ten Agents of Kuwait Airways presented with a Certificate of Merit for performance during the period 2001-2002. "Niryat Shree - Gold Trophy” for the year 2000-2001 of FIEO in the highest service category, for its outstanding contribution to Foreign exchange earnings and excellence in service. Award of Appreciation – presented by Sir Richard Branson, Chairman Virgin Atlantic Airways & Virgin Group of Companies – 2000. Continental Airlines Outstanding Sales Award for 1990, 1992, 1993, 1996, 1999 & 2000. Top Pax Agent Award Singapore Airlines, 1999-00. Top Agent Award, Air Lanka 99-00. Second Most Productive Agent, Indian Airlines 99-00. Outstanding Performance Continental Airlines-10 yrs ,1999. Top Pax Agent Award Singapore Airlines, 1998-99. Top Agent Award, Air Lanka 98-99. Most Productive Agent, Indian Airlines 98-99. Top Agents Award – Gold from Balkan Bulgarian Airlines – 1998. Appreciation Award Thai Airways, 98. All Nippon Airways Certificate of Achievements 1998. World's best GSA award from Continental Airlines – USA in 1998. Golden Performance Award Malyasian Airlines 97-98. Most Productive Agent, Indian Airlines 97-98. Outstanding Performance Award – Emirates for 1997-98. Top Pax Agent Award Singapore Airlines, 1997-98. Top Agent Award, Air Lanka 97-98. Outstanding Performance Continental Airlines, 1997. All Nippon Airways Appreciation Award 96-97. Successful launch of RNAC to STIC, Bangalore 96-97. Appreciation Certificate Thai Airways, 96-97. Malyasian Airlines Golden Performance Award - South India 96-97. Top Pax Agent Award Singapore Airlines, 1996-97. Certificate of Excellence, Indian Airlines 96-97. Top Agent Award, Air Lanka 96-97. Travel & Tourism Award 1996 by Travel Media Forum & Unit Hotels Forum. Presented by Indian Institute of Tourism and Travel Management Delhi Chapter - Annual convocation 1996 for distinguished contribution Travel & Tourism Industry. Top Pax Agent Award Singapore Airlines, 1995-96. Top Agent Award, Air Lanka 95-96. Malyasian Airlines Golden Performance Award - South India 95-96. Malyasian Airlines Golden Performance Award - South India 94-95. Udyog Rattan Award for 1993. Malyasian Airlines Golden Performance Award - South India 93-94. Malyasian Airlines Golden Performance Award - South India 92-93. India Friendship Award for 1992. Ethiopian Best GSA Award 92-93. Malyasian Airlines Golden Award 91-92. Golden Performance Award India Malyasian Airlines 91-92. Top Agents Award, Air Lanka to Stic, Bombay 91-92. Golden Performance Award India by Malaysian Airlines for outstanding achievement in Passenger sales for 1991. Award for Excellence for 1991 – from the President of India. Gold Award (Top Agent Award) 1990-91 by Air Lanka. Golden Performance Award India Malyasian Airlines 89-90. Golden Performance Award India Malyasian Airlines 88-89. Golden Performance Award from Malaysian Airlines in recognition of the outstanding achievements in passenger sales for 1987-88 to STIC, Madras. Malyasian Airlines Golden Award 86-87. Sales Award Eastern Airlines 85. Top Agent Award from Air Lanka in recognition of outstanding achievements during 1983-84. Malyasian Airlines Golden Award 83-84.